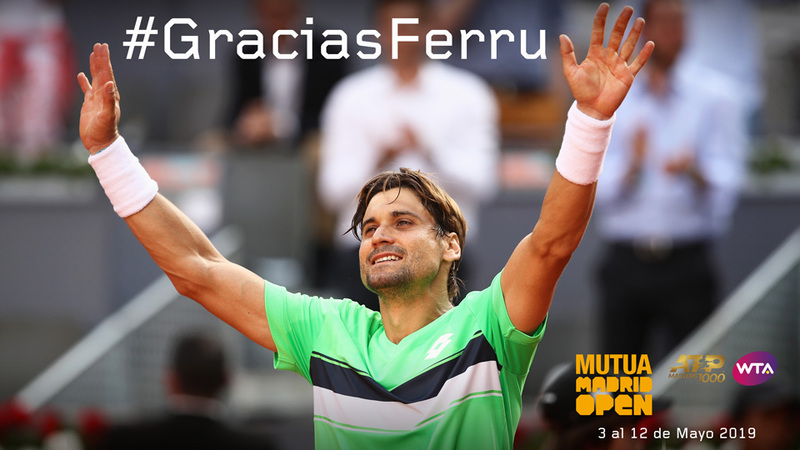 David Ferrer has chosen the Mutua Madrid Open as the last tournament of his professional career, and the Mutua Madrid Open has accepted the Spaniard’s decision with open arms. This Wednesday, the tournament organisers granted the first wildcard to Ferrer, who will now be able to say goodbye to the tour in the Caja Mágica, from 3 to 12 May, in front of his home crowd. “David is one of our country’s biggest tennis players, with a memorable career, but above all he is an exceptional person, one of the best I have met on tour”, said Feliciano López, the Director of the Mutua Madrid Open. “I’ve shared many years with him and I can say that it has been a great pleasure. It’s an honour for us that he will play the last tournament of his career at the Mutua Madrid Open. I’m sure it will be an emotional goodbye, at home, in front of all the fans that have cheered on his grit, his passion and his dedication. Ferrer can leave with peace of mind because he has given his all”. A professional since the 2000 season, at the end of 2018, Ferrer announced his intention to say goodbye to the elite in 2019 by playing some of the most important tournaments of his career. The Alicante native, who reached number three in the world, chose the Mutua Madrid Open as the final stop on his journey on tour, before bringing a successful career to an end at the age of 37. Ferrer has played in the Mutua Madrid Open 15 times, with his best results coming in 2010 and 2014, two seasons in which he reached the semi-finals. With 27 titles, his sporting achievements will mean that he goes down in history as one of the best Spanish players of all time, with a legendary career that will never be forgotten. In addition to those 27 titles, Ferrer has three Davis Cup victories under his belt (2008, 2009 and 2011), a French Open final (2013) and seven participations in the ATP Finals, which only add to his legend. Playing in an era with four giants such as Roger Federer, Rafael Nadal, Novak Djokovic and Andy Murray, it is to his great credit that the Spaniard reached such heights that he could trade blows with that group, making room for himself when his opponents were playing their best tennis. To mark Ferrer’s retirement from the professional game, the Mutua Madrid Open will be holding a series of events in tribute to him, which will be revealed soon.